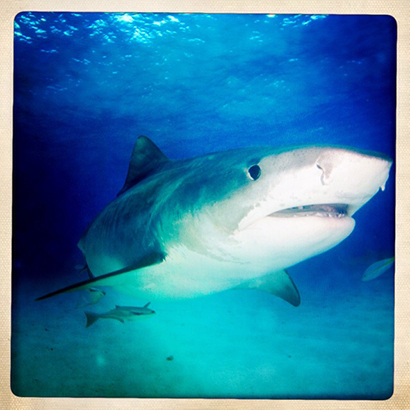 Found in tropical and sub-tropical waters throughout the world, the tiger shark (Galeocerdo cuvier) is one of the most widespread fish in our seas. It is classed as an ‘average’ sized shark, though they will still reach a length of 15 feet which is plenty big enough in Fishpool’s eyes. The largest ever caught was a female more than 18 feet long and weighing around one and a half tons, but sadly, and typically, this is a species under threat from over fishing and over finning. Their fondness of coastal water has led to greater persecution and they have been actively culled for many years for fear of attacks on humans. The females move close inshore to breed and it is then that interactions with people are most likely. Of course, for too long it has been Man’s prerogative to rid the water of sharks at such times rather than stay away from the shark’s environment and leave them be. Friday Allan’s Fangler (FAF) – March 2017, and on time!! Yeehah!! !